When sickly language teacher Kwon (Seo Young-hwa (서영화) returns from a trip to the mountains to cure her ailments, she is surprised to discover a hand-written letter by Japanese ex-boyfriend Mori (Ryo Kase) waiting for her. Settling in the local coffee shop, Kwon begins to read the passionate account of how Mori has travelled to Korea in order to find and be with her, and his encounters with pretty barista Yeong-seon (Moon So-ri (문소리) as well as his friendly guest house owners (Yoon Yeo-jeong (윤여정) and Kim Ee-seong (김의성). Hill of Freedom (자유의 언덕) is director Hong Sang-soo’s (홍상수) 16th feature and as with much of his recent output the film has proved a hit on the festival circuit, screening at Venice, Toronto, Vancouver, Busan, and London, respectively. The film is also a notable return to a male-orientated narrative following a highly successful run of female-centered films (Nobody’s Daughter Haewon, Our Sunhi). Fans of director Hong will find much to enjoy in Hill of Freedom, as his trademark sense of humour, focus on naturalised locations and mise-en-scene, as well as his often whimsical and charming filmmaking techniques, are all present and correct. The manner in which the narrative unfolds is one of the film’s highlights as Kwon, having received Mori’s letter, drops the pages in a stairwell and in her haste to collect them puts them back together in the incorrect order as well as – crucially – leaving a page behind. When Kwon later reads the letter and Mori’s story transpires, the events are presented in a non-linear manner, as with the pages themselves. The concept is quite endearing, particularly with Mori’s quest to find and declare his affections to Kwon presented through an emotional gamut of highs and lows rather than a progressive state, adding an interesting and unpredictable spin to the story as well as to the genre as a whole. Yet Hill of Freedom is not without issues. Director Hong has made awkward encounters amongst his protagonists part of his modus operandi as an auteur, and the results are often alluring character moments that reveal a great deal about the psychological status at hand. In Hill of Freedom however such confrontations are often either cringeworthy viewing experiences or unintentionally comedic – and occasionally, both at the same time. Chiefly this is due to the dialogue which is mostly in the English language, and despite the wealth of acting talent on display it is a feature that no-one seems to be particularly comfortable with, except veteran actress Yoon Yeo-jeong who provides the best performance within the film as the kind guest house owner. While the awkward use of English may very well be an attempt to convey the naturally clumsy chance meetings between people through language, it is often quite over-exaggerated to the point where tension and development are diffused. English is also a problem simply as dialogue. It is impressive that director Hong can write a script in a different language, yet the discussions that occur are delightfully naive, particularly during the scenes in which Mori discusses politics, is drunk and/or attempting to philosophically discuss time as a concept. As such the conversations that develop and evolve lack the sincerity of director Hong’s earlier films, and as a result Hill of Freedom is an enjoyable yet flawed addition to his filmography. 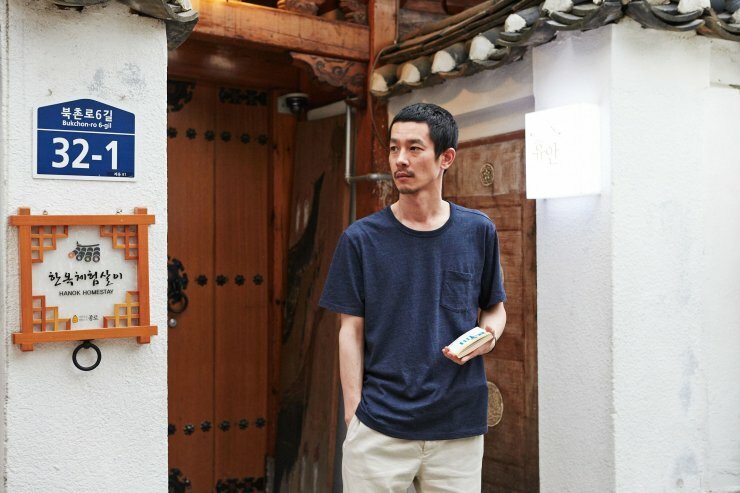 Hill of Freedom is return to male-centered narratives for writer/director Hong Sang-soo, which follows Mori on a quest to find ex-girlfriend Kwon and declare his love. All the staple features of director Hong’s films are apparent throughout the film and there is much to be enjoyed through the charming narrative style and camera techniques. However, chiefly due to the mostly English script, the dialogue is often naive while the delivery is uncomfortable for most of the actors involved. Hill of Freedom is an enjoyable yet flawed addition to director Hong’s body of work.